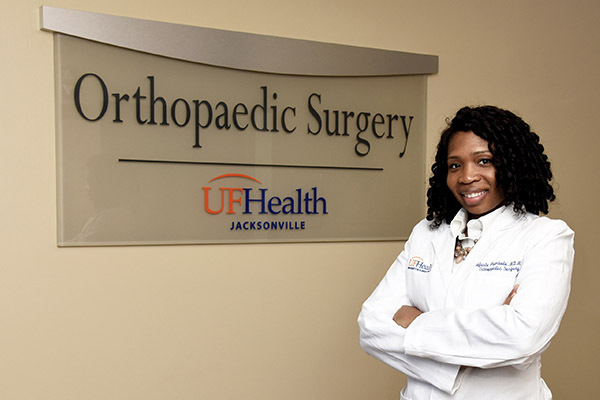 Orthopaedic surgeon Obafunto Abimbola, MD, MPH, continues fellowship while looking back on five-year residency program at UF COMJ. There is nothing like nagging pain or joint discomfort that seems to come out of nowhere and progressively worsen. Knee and hip issues can be particularly troublesome, especially for adults approaching their golden years. Obafunto Abimbola, MD, MPH, has consulted with scores of patients who seek comfort and desire to resume the activities and hobbies that bring them joy. Oftentimes, surgery is necessary. Those special instances have inspired and motivated Abimbola over the past several years, as she’s helped patients regain comfort and mobility while she continued to learn and hone her skills as an orthopaedic surgeon. 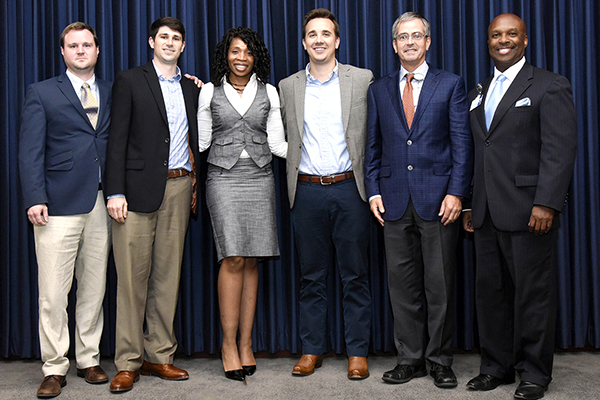 Abimbola recently completed UF COMJ’s five-year orthopaedic surgery residency program, which culminated with a graduation ceremony on the UF Health Jacksonville campus. As she continues a fellowship in hip and knee reconstruction, she looks back on her personal, educational and medical journey so far, most notably the UF COMJ training experience that has yielded so much growth. Abimbola, a first-generation Nigerian-American, was born and raised in Greensboro, North Carolina. When she was young, her parents tried to steer her toward one of three occupations they said would make them proud — a lawyer, medical doctor or engineer. Abimbola didn’t think she’d be interested in medicine and refuted the other two fields out of rebellion. She figured she would pursue “something completely left-field,” like visual art or marine biology. “I took some art classes in high school. I enjoyed it as a hobby, but not enough to invest all of my time and effort into it,” Abimbola said. When she explored marine biology, she quickly realized that wasn’t the path to take, either. Abimbola attended the University of North Carolina at Chapel Hill, where she earned a degree in exercise and sport science, with a specialization in athletic training. Envision working for high-profile professional sports teams, traveling often and visiting some of the world’s most notable cities and sports stadiums, while tending to superstar athletes. That could have been Abimbola’s career as an athletic trainer. Abimbola returned to UNC Chapel Hill for medical school. A special summer program after her first year allowed her to shadow an orthopaedic surgeon in New York. She rotated with that same surgeon during her final year. A career in orthopaedic surgery became the plan. 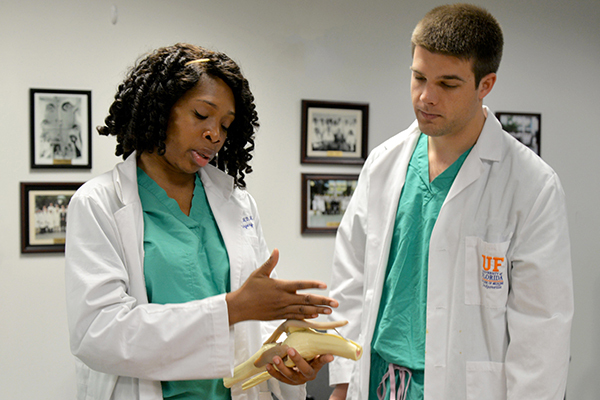 UF COMJ was one of Abimbola’s top choices for orthopaedic surgery residency. She said it was the most diverse program of all the ones for which she interviewed. “In terms of gender and ethnic diversity, it was impressive for an orthopaedic surgery program to look like that. To me, that was very welcoming,” she said. Abimbola also sensed strong camaraderie among the resident physicians she met at the time. She said they seemed proud of their program and work, and happy to be at UF Health. She experienced that energy firsthand once she began training. 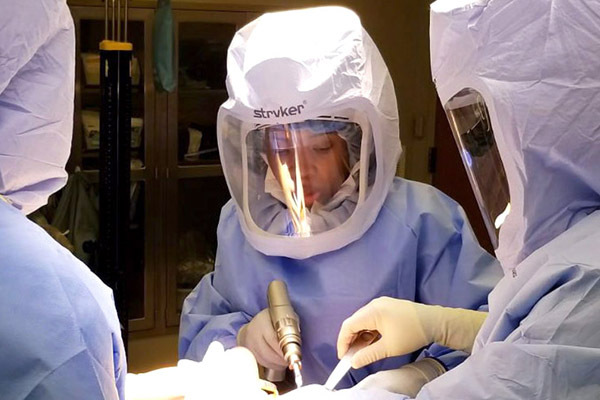 Abimbola describes the orthopaedic surgery residency program as challenging and dynamic, featuring a host of hands-on — and often intense — clinical rotations during each of the five years. Some of those rotations include plastic surgery and vascular surgery in the first year, and pediatric orthopaedics, adult reconstruction and foot and ankle in subsequent years. With UF Health Jacksonville having the only adult and pediatric Level I trauma center in the region, residents also gain plenty of experience in trauma care. Highway collisions, gunshots, falls and other accidents are some of the reasons patients are rushed to UF Health TraumaOne, which has the infrastructure and personnel to effectively and efficiently handle mass casualty events. Unfortunately, that can’t always happen. Some people wind up losing a limb. She sighs and pauses while reliving these exchanges, recalling the patients’ devastation and remembering how she aims to express empathy and compassion in those moments, yet maintain a calm and confident professional demeanor. Between surgeries, patient consultations and didactic sessions, Abimbola’s days often ran from 6 a.m. to 6 p.m., and sometimes later. Time management was key. Amid the challenges, Abimbola found joy in her patients — particularly the ones requiring joint reconstruction or replacement, her chief interest. She fondly remembers patients who wished to walk and run again, or simply engage in old hobbies such as antique shopping. Paul Dougherty, MD, a professor and chair of orthopaedic surgery and rehabilitation at UF COMJ, says Abimbola is an outstanding doctor who exemplifies many of the ideals department members strive to embody in their clinical practices. As an elective during her residency, Abimbola spent two weeks in Kenya working as an attending physician at a mission hospital in the town of Bomet. She worked alongside local medical residents, guiding many of them through challenging surgeries. She chose Kenya because she wanted to assist a developing country, where resources are extremely limited, yet ailments and the need for surgery are equal to that of first-world nations. Abimbola intends to hold tight to her interest in international health, regardless of where she practices. Since completing her residency, she has begun a fellowship in knee and hip reconstruction at Cape Cod Orthopaedics and Sports Medicine in Massachusetts. She’s still weighing her options of academic or private practice afterward. Remember, at one point, Abimbola thought she might become an athletic trainer, a visual artist or even a marine biologist. Through the journey, she found her true calling. She is doing what she loves and has gained the experience and skills that make her a highly sought-after orthopaedic surgeon. She is fulfilling her dream. Her loved ones are proud and her patients are healthier and happier. 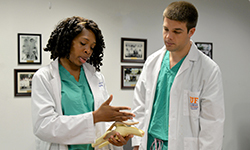 Visit hscj.ufl.edu/orthopaedic-surgery/residency to learn more about the orthopaedic surgery residency program at UF COMJ. 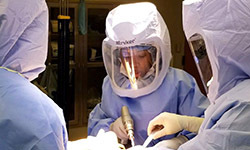 Obafunto Abimbola, MD, MPH, operates a surgical drill during a procedure at UF Health Jacksonville. She says her orthopaedic surgery residency featured a host of intense, hands-on clinical rotations. 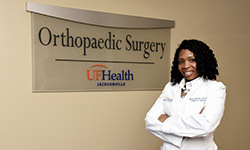 Abimbola credits the University of Florida College of Medicine – Jacksonville and UF Health Jacksonville for helping her grow and thrive as a surgeon. Abimbola confers with orthopaedic surgery resident Zachary Elstad, MD, before an early-morning didactic session. 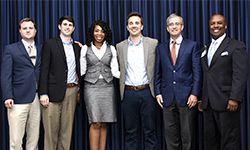 Abimbola was one of four orthopaedic surgery residents who completed the five-year program in 2018. They were recognized during a special ceremony on the UF Health Jacksonville campus.